We like to stay current with as much information and certifications as possible. The more we know the better we are able to service our customers. Darren Lucas received his designation as of a Certified Professional Pond Contractor (CPPC) by the International Professional Pond Contractors Association (IPPCA). Attaining the CPPC certification was not simple. Darren had to be a member in good standing, submit a portfolio of completed projects with customer verification of proper installation, maintenance and service, and provide proof of insurance. Easy Pro is a leader in the water garden supplies market. Darren Lucas has been recognized as a Certified Aquatic Specialist. Firestone Specialty Products produces rubber liners for ponds. 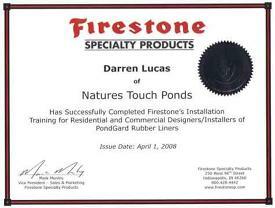 Firestone offers a liner installation training for residential and commercial installers of Pond Guard Rubber Liners. Those who can pass the written test receive this certification. 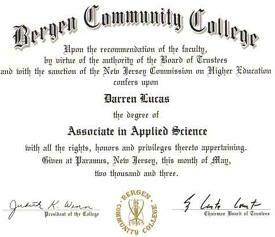 Darren Lucas has a AAS in Ornamental Horticulture from Bergen Community College. 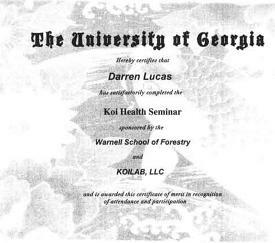 Each winter the University of Georgia offers a Koi Health Seminar. It is headed by Vicky Vaughn who is a koi health expert. This seminar hosts numerous speakers consisting of veterinarians that specialize in fish. This seminar not only discusses the basics on the upkeep of fish but also about koi diseases, water chemistry, parasites, nutrition, and microscope training to name a few. 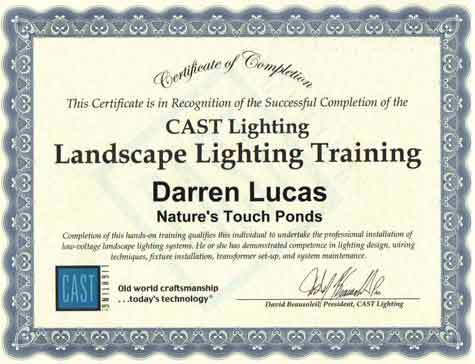 Cast Lighting offers a hands-on training seminar on showing every step in installing low voltage lighting. This event is held at a residential job site and show design and installation of a complete system start to finish.